My figurative subject matter and the way it is depicted has evolved in spirals over the past 70+ years (ie the recurrence of both subject matter and visual language which appear and disappear over the years and then reappear) and groups, mainly inspired by late Goya, Picasso and Braque. Most of my figuration faded in the late 1960’s when, at about the same time, I changed completely from using oil point to water-based acrylic. 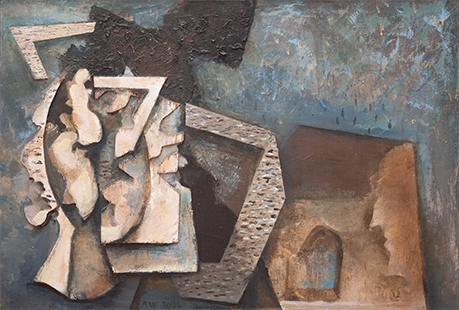 This subject matter (the depiction of human/animal/landscape, etc)began to fade into abstraction and did not reappear until the late 70’s/early 80’s (ie Reflections after Las Meninas and other series, Blind Leading the Blind, Reveries, Interiors) when also ideas about forces of nature were beginning to form. Landscape/seascape etc also began to reappear again in the late 80s with the re-introduction of texture and chiaroscuro. It was in the mid 1990’s that etchings and paintings about memory loss could well have reflected the growing awareness of advancing age and the possible effect on the mind. These works have images of the skull and/or the Filofax juggling with symbols, letters and numbers. Also at this time ideas about the moment before perception, allusion/illusion, multiple view points and multiple horizons imply the ageing grain had more to deal with comprehending what is saw. During the last two decades, both the subject matter and the manner of their depiction of works from the late 80’s and 90’s have been demanding further exploration; several have been completed and many are on the way. This reappraisal of older works seems such a positive gift of advancing age especially as it is the work itself that makes the demand for improvement. I feel some of my visual discoveries during recent years could be of help but what I value most is an unexpected solution for each work, which can be risky and lead to failure, but could also result in a different work.